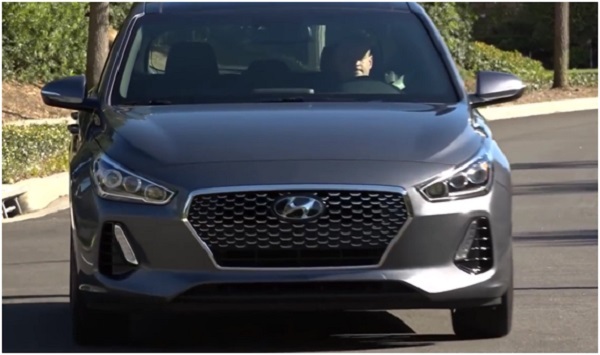 In the review the representative of new cars Hyundai 2017-2018 year new Hyundai Elantra GT — photo and video, the price and complete sets, technical characteristics of the turned hatchback Hyundai i30 for America. The public premiere of the new generation Hyundai Elantra GT took place in early February 2017 in Chicago as part of the Chicago Auto Show. 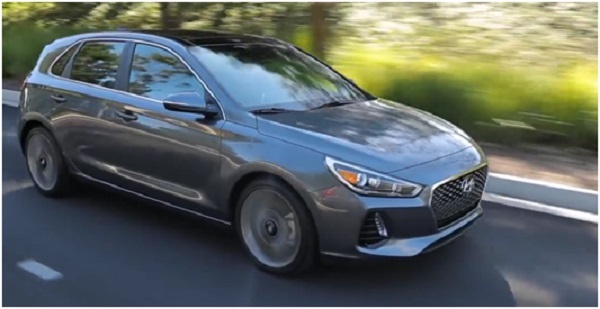 Sales of the new Elantra GT 2018 model year, equipped with gasoline four-cylinder atmospheric engines 2.0 (165 hp 203 Nm) and turbocharged 1.6 T-GDI (204 hp 265 Nm), in the North American market will start in the spring of 2017 at a price of 19,000 dollars. 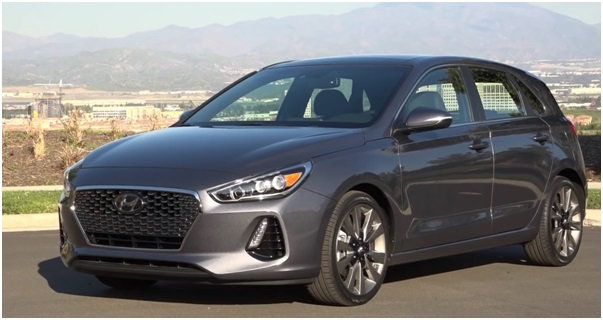 The new five-door hatchback Elantra GT from Hyundai Motor America is positioned by the manufacturer as a compact sports car with powerful petrol engines honed at the Nurburgring by driving characteristics, expressive design, comfortable interior with expensive finishing materials, large luggage space and rich equipment — in one word a premium class … as By American standards. 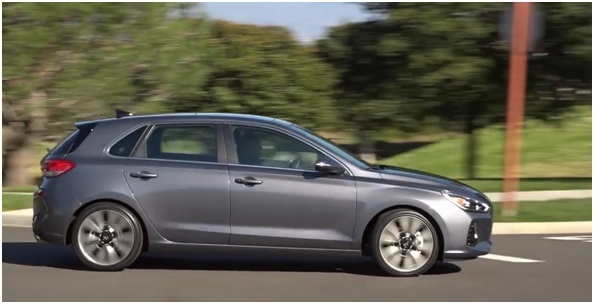 As a matter of fact, we have a new Hyundai ay30 with a corrected exterior exterior design, a slightly different interior and more powerful engines. 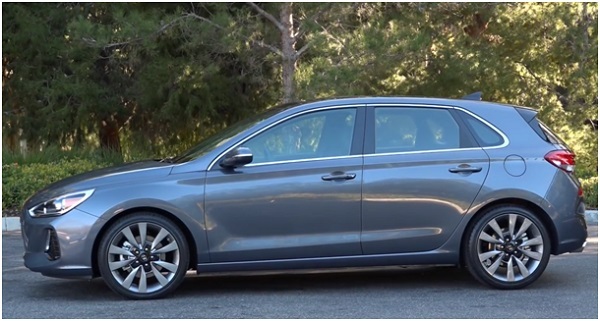 The external dimensions of the body of the Hyundai Elantra GT 2017-2018 are identical to the dimensions of the Hyundai i30 and are 4340 mm in length, 1795 mm in width, 1455 mm in height, with 2650 mm of wheelbase. 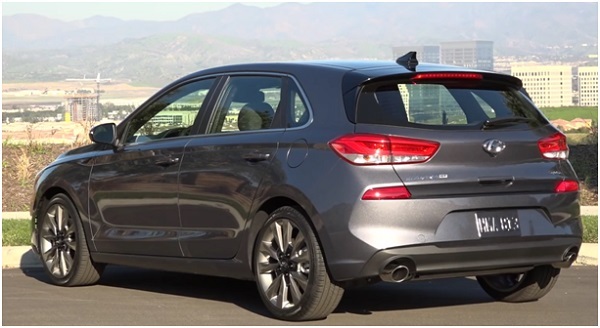 The body design with a wide application of high strength steel, reaching 53%, the availability of advanced Adaptive Cruise Control with stop / start, Automatic Emergency Braking with Pedestrian Detection, Lane Keep Assist and Attention Assist, High-Beam Assist and Blind Spot Detection with Rear Cross-traffic Alert also brings together the American and European versions of the five-door hatchback from Hyundai Motor. That’s just the suspension of all wheels in the Hyundai i30 is completely independent, and the basic configuration of the Hyundai Elantra GT is equipped with a budget semi-independent suspension with a torsion beam, like the European version of the Hyundai Elantra sedan and only for the modification of the Elantra GT Sport there is a rear multi-link independent suspension. Suspension suspension, and the appearance of the «American» is clearly more interesting than the proposed on the European, Korean and other markets hatchback i30, and especially represented in the photo version of GT Sport. The differences between the cars may be minimal, but the American version looks more expensive and respectable, especially with LED headlights offered for extra charge, chic 18-inch wheels with a stylish design of light alloy wheels, a sports rear bumper with aerodynamic chips complemented by a diffuser, and Nozzles of exhaust pipes of large caliber. 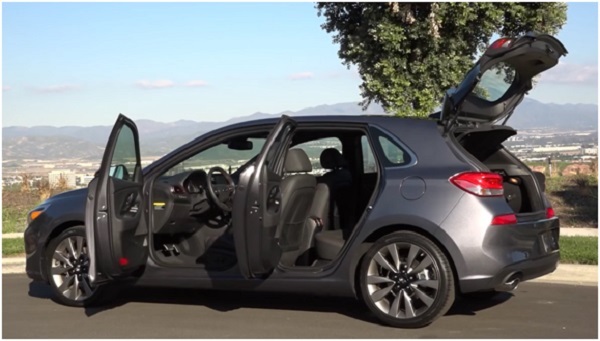 The interior of the hatchback fits the bright body of the novelty and demonstrates the European style, high ergonomics, high-quality finishing materials and a rich level of equipment. There is an easy-to-read dashboard, a compact steering wheel with a plump rim, front seats with solid lateral support and a length of cushion, an acceptable seat for three passengers in the rear seats and a compelling luggage space for competitors to expect to be able to accommodate from 395 to 1301 liters of luggage (Ford Focus 277 — 1062 liters, new Mazda 3 — 350-1250 liters, Volkswagen Golf 7 — 380-1270 liters). Basic equipment is rather modest and will be pleased with the availability of 7 airbags, stabilization system, air conditioning, driver’s seat with electric adjustment. Options include dual-zone climate control, leather trim, front seats with electric drive, heating and ventilation, keyless entry system with the engine start / stop button, advanced multimedia complex AVN 5.0 infotainment system with 8-inch color screen (Apple Car Play, Android Auto, navigation), wireless charging for smartphones, premium audio system Infinity, electronic assistants and assistants, which were mentioned in the review a little earlier. Specifications of Hyundai Elantra GT 2017-2018. For the hatchback, a pair of gasoline engines are offered, front-wheel drive, all-wheel brakes with electric parking brake … We already mentioned the suspension (McPherson struts in the front, and the torsion bar at the rear or the multi-link), there is also a Drive Mode system that changes the performance of the units And car assemblies. The basic 2.0-liter atmospheric engine with direct fuel injection (165 hp 203 Nm) is combined with 6 MKPP or 6 automatic transmissions. More powerful turbocharged 1.6-liter T-GDI (204 hp 265 Nm) familiar to us on models Kia cee’d GT and Kia Soul GT is offered exclusively for the Elantra GT Sport version and is able to work in tandem with 6 manual gearboxes or 7DCT (robotic box Gears with two «dry» clutch discs). Perhaps in the very near future a motor company will be replenished with a 2.0-liter turbocharged engine with a return of more than 250 horses.